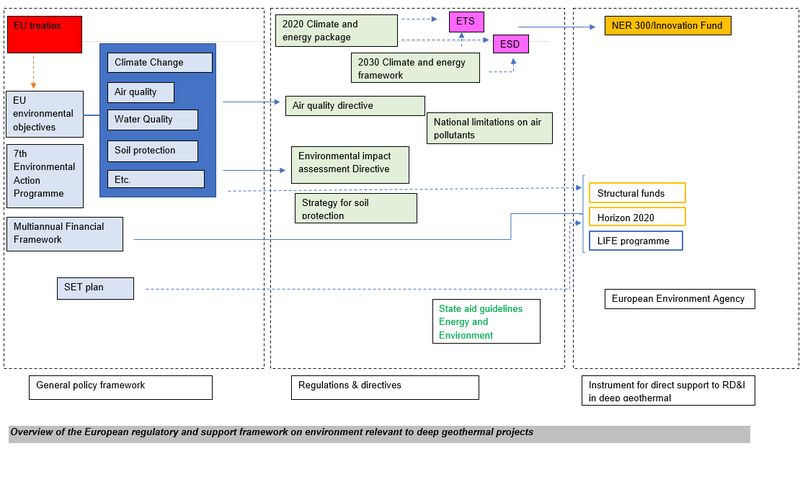 Geothermal energy, as defined in the Renewable Energy Directive (see EGEC factsheet on the definition of geothermal energy), is subjected to a wide array of environmental legislations that minimise the possible environmental impacts linked to the development of an industrial activity such as developing geothermal resources. The European, national and regional regulations about geothermal energy technologies aim to avoid environmental impacts for any segment of the value chain, from drilling to f-gas used in heat pumps for individual geothermal heating systems. These regulations can be laid out at the European level, through directive or regulations, and may be monitored by the European Environmental Agency. Enforcement however usually happens at the local level where national and regional authorities and agencies agencies play a key role of advising new projects, monitoring existing installations and enforcing regulations in case of infringement. Several environmental studies and life cycle analysis of geothermal plants have been published. Details of these publications can be requested to EGEC. - DGRT (Resolution of Tuscany Regional Council) no. 344 of 22/03/2010 « Guideline criteria for the containment of atmospheric emissions from geothermal power plants ». - Tuscany Region Resolution no. 229/2011 Legislative Decree 152/06 and amendments, art. 26 Statement on the environmental compatibility of the project for the "Rehabilitation of the Geothermal Area of Piancastagnaio", in the Municipality of Piancastagnaio (SI), submitted by Enel Green Power s.p.a.
ARPAT - Air Quality Monitoring: Considering that the operation of geothermal power plants represents a peculiarity of the Tuscan territory, the Region of Tuscany has adopted a specific sector legislation, DGRT no. 344 of 22/03/2010, which performs, to a certain extent, the function of a B.A.T. document (Best Available Technology) for this specific category of plants. - Regional legislation (DGRT n. 344 of 22/03/2010), in ARPAT’s (regional environmental authority) reports it was chosen to refer to a lower value of 0.2 µg/m³ (200 ng/m³) averaged over a period of one year. Such value is consistent with the relevant health guidance levels developed by the US Agency of Toxic Substances and Disease Registry (ATSDR), similar to the US Environmental Protection Agency (EPA)’s threshold values for the non-carcinogenic effects of chemicals in the environment to assess contaminated sites (2007). ARPAT releases every year the results of its controls on emission from geothermal power plants in Tuscany (see Annual Report 2017, available in Italian and in English - translated by EGEC) . In the 2018 issue, they also publish a detailed information brochure available in Italian and English (translated by EGEC). In Italy, geothermal power production has been part of the energy system for more than a century. The development in the Monte Amiata region date back from 1955. For a century geothermal energy has been avoiding the use of fossil energy in Tuscany for power production, and for heating replacing fossil fuel boilers. Due to the long history of industrial activities in Tuscany, and some mistaken past geothermal development in the area, some local opposition exist against geothermal energy – centered around the Monte Amiata plants. This opposition notably puts forward CO2 emissions from geothermal as an issue. While 63% of plants emit less than 100 gCO2/kWhe, and the weighted average emissions are 122 gCO2/kWhe (which amounts to 10% of coal emissions, 25% of those from a CCGT). In recent decades, the geothermal industry in Tuscany has been working to further reduce its environmental impact, notably developing cascading uses in district heating or for the industry (e.g. the Vapori di Birra). These cascading uses further displace fossil energy by reducing the need of gas for heating, leading to further reduced CO2 emissions. It is important to provide clear and detailed information about the regulations on environment impact and the effect of geothermal development on the air, water and soil.